WARSAW (Reuters) - Pope John Paul II spent decades constantly questioning whether he was worthy of the role he was called to carry out, according to private diaries published on Wednesday in defiance of his request that they be destroyed. John Paul, who led the Roman Catholic Church from 1978 until his death in 2005, will be made a saint in April and remains for many Catholics a towering model of faith and commitment. The diaries give a glimpse into his interior spiritual life, showing a man who never became complacent despite the grandeur of the papacy and his star status among many Catholics. Instead he agonised about whether he was doing enough to serve God. His handwritten notes, published as "John Paul II: I am very much in God's hands. Personal notes 1962-2003," are a series of his reflections rather than a daily diary. "The word of the Lord. Do I love the word of God? Do I live by it? Do I serve it willingly. Help me, Lord, to live by your word," he asked. "Do I serve the Holy Spirit that lives in the Church?" In the same passage, he wrote, alternating between Latin and his native Polish: "A pure, holy and immaculate sacrifice. This is why He demands from his priests that they should be of undivided heart (celibate) and demands priestly purity. Jesus, help me!" In the foreword to the book, Dziwisz said he did not burn them because they hold the key to understanding the pope's private spiritual life. 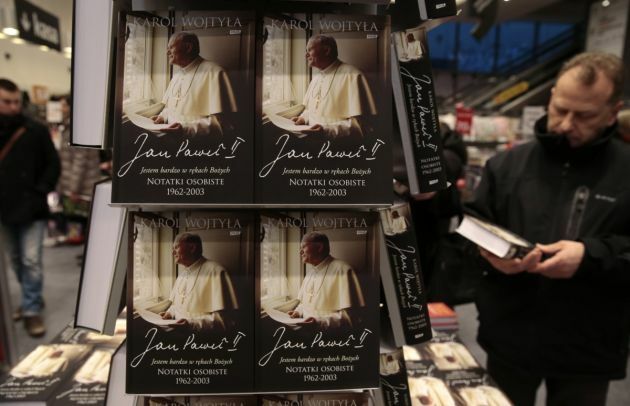 "They reveal the other side of the person whom we knew as .. the pastor of the universal Church," wrote the cardinal, who was both praised and criticised in Polish Catholic circles after announcing the publication of the book last month. The picture that emerges deepens but does not jar with his public image, in contrast to the posthumous diaries of Mother Teresa - who died in 1997 and was beatified by John Paul in 2003 - that revealed her long periods of doubt about God's existence. Despite the questioning of his own role, there is no sign in the diaries from 1962 to 2003 that the pope's belief in God wavered. The first signs of his questioning appear in comments from 1970 where he wrote: "Can the misfortunes of people close to me, which have happened recently, be seen as a punishment? As a sign? What can it mean?" He paid close attention to the skills required of a priest. "What language do I use when I speak to people?" he asked in 1974. "Do I proclaim the Gospel with complete conviction?" In his final years, debilitated by illness, the pope's entries become sparser and the handwriting less assured. The pope, who before his final illness travelled tirelessly around the globe preaching the Gospel, wrote in a sloping script in Italian across the bottom of the page: "Jonah, this is the fear of proclaiming the love of God."